Today we said goodbye to Tsavo East. Every time our Tsavo East experience comes to an end we get the feeling that we have unfinished business but that's what makes us keep coming back. Our KWS Safari Card ran out at 10.30am, so we got up early and packed everything into the Landrover, before heading to the Pipeline Road to see what might come in to the waterholes. Unfortunately Dave was not feeling too well, so he was not able to fully enjoy the scenes which unfolded before us. 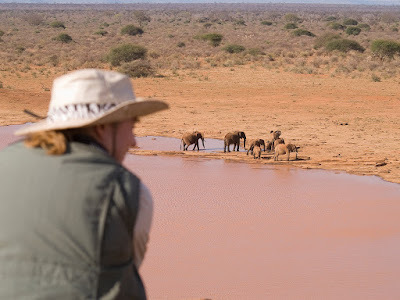 We parked up at one of the waterholes, which has one shallow area and steep surroundings, so that we knew which direction the animals would approach from, for us to get the best photographs. After a while, a dazzle of Burchell's Zebra came in to drink. They were followed shortly afterwards by some very nervous Coke's Hartebeest, which scattered every time another vehicle came by. Eventually they felt confident enough to come into the waterhole and we were able to get some nice images of them drinking. Later, another Dazzle of Burchell's Zebra came in and afterwards one of the local guides told us that three lions with cubs had been spotted further along the road by about a kilometre. We searched but could not find the lions and headed back slowly, scanning the landscape. As we reached our original location, we saw a Topi. This is the first time we have ever seen a Topi in Tsavo East, so we were delighted. Further along, we found a family of Elephants, with two babies, one of them very young, enjoying another waterhole. Whilst we were photographing this, behind us a Tawny Eagle was getting very agitated by the presence of a huge flock of Red-Billed Quelea, so we photographed that too. 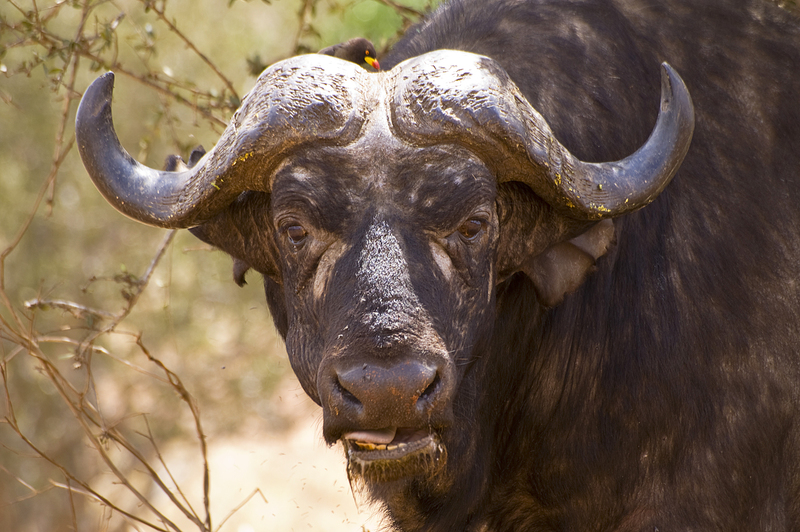 We finished our Tsavo East experience with the largest herd of Buffalo we have yet seen, with over 100 animals. Dave was still feeling unwell, so we went straight to the Silent Guest Resort, so that he could get a rest. Whilst Dave was resting, the rest of us took a trip along to the Ngutuni Private Reserve. We checked out the Ngutuni Lodge and decided it would be a great bit of luxury to perk Dave up, so we booked for tomorrow night. After that, we shall be heading for Tsavo West. If you have enjoyed this post, please consider making a donation to out chosen charity, Save The Elephants through our Just Giving Page. We made an early start today for the long bone-shaking drive up to the Galana River at Sala Gate. This drive gives you some idea of the scale of the Tsavo wilderness. Along the way we photographed Elephants and a large herd of buffalo. 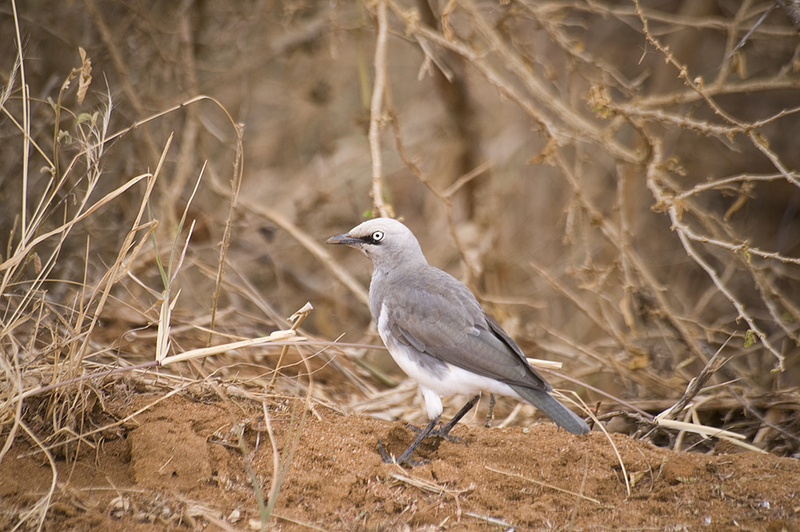 We also tried unsuccessfully to photograph several Sunbirds but were able to find a very obliging Secretary Bird. 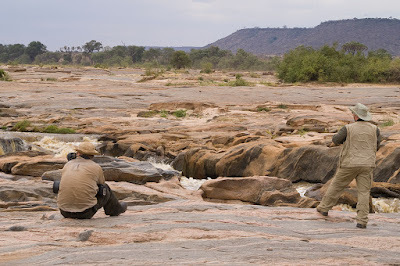 We covered several of the trails around the edge of the Galana River, looking for the large Lion pride which can often be seen there but were unsuccessful. We later heard that thirteen Lions had been spotted just outside the Park on the Malindi Road! 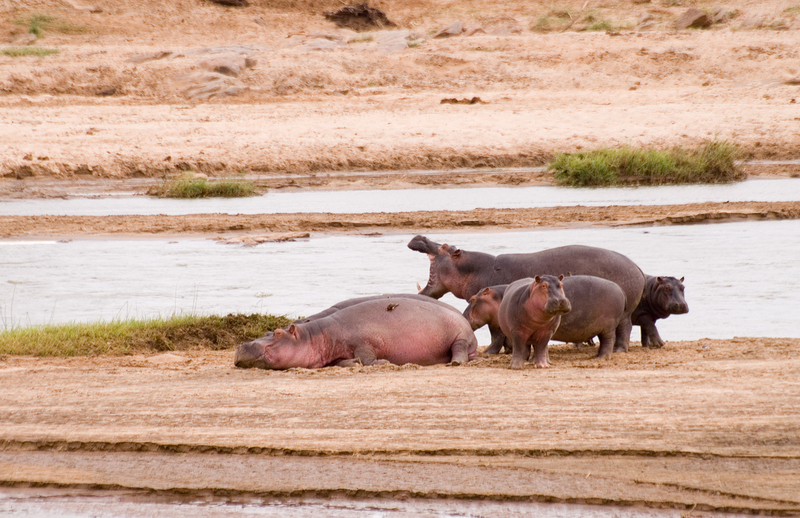 We were, however, able to find a pod of Hippos, who did what Hippos do best – sleep, fart and jossle for space. After spending the morning searching this part of the Galana for Lions, we headed back to the campsite for a break, managing to find a Sand-Grouse pair with a chick along the way. After a rest, we then checked out the Kanderi Swamp and the Pipeline Road again. While we were waiting at one of the waterholes for something to come in, one of the local guides told us where a Cheetah had been sighted. We did find it, but the Cheetah was too far away for decent photographs. We then had one last look at Kanderi Swamp before returning to the campsite to cook supper. Howard would like it known that he built an excellent fire and started it with one match. As none of the others were there to see this, they have declared the result void. After last night's shower, dinner and rest in the Silent Guest Resort in Voi, we were feeling refreshed and relaxed, so we stocked up on more supplies and headed into Tsavo East again. The KWS staff at the gate informed us that our information about the injured elephant had been passed on to the relevant team. We were only 10 yards inside the gate, when we stopped to photograph a gang of delightful Dwarf Mongoose. A few hundred yards further on we were photographing Weaver Birds at their nests. We then headed for Kanderi Swamp, where we found Elephants, Coke's Hartebeest, Waterbuck, Impala and Warthog. We sat around for a while to see if anything else would come in and were entertained by the arrival of the biggest Yellow Baboon troop we have ever seen, with over 100 animals! There were Baboons of all sizes, from newborns to adults in a massive spread across half the swamp. We then headed for the Public Campsite for a brew and to give us a chance to cool down in some shade, away from the mid-day sun. After a relaxing hour, we then headed along the Voi River, which looked to be completely dry. 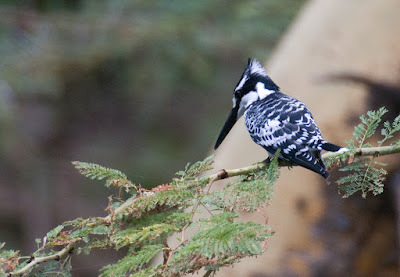 We saw Somali Ostrich and took some nice shots of Red-Billed Hornbill here before heading to the Pipeline Road. Here we found more Lesser Kudu and Elephants at the waterholes. 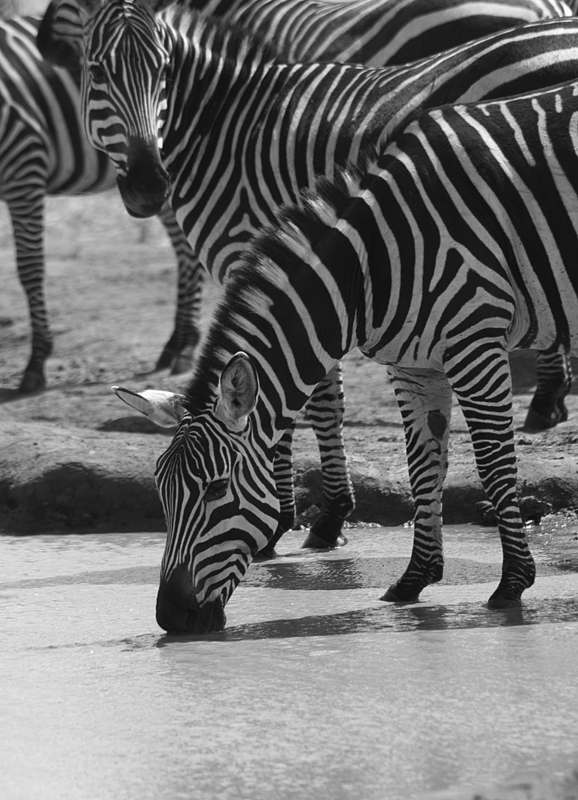 We also parked up near one waterhole as a dazzle of Burchell's Zebra came in to drink. After the left a second group came towards the waterhole but they became nervous at the sight of a tour group's minivan, which approached between them and the waterhole. They moved around to approach from a different direction but were startled and galloped off when one of the people in the minivan either dropped or threw an empty plastic water bottle out of the van. One of the tour guides told us that a Cheetah had been spotted near one of the pumping stations on the pipeline road but we could not see it anywhere. However, we did see a Jackal drinking at one of the waterholes. As evening drew in, we headed back to the campsite to pitch camp and prepare dinner. Karen would like it to be known that she built a wonderful fire, much better than Dave's sausage infested fire and infinitely better than Howard's non-fire. Tomorrow we shall head up to the Galana River. If you enjoyed this post, please consider making a donation to our chosen charity, Save The Elephants through our Just Giving page. First the apology: we had intended to blog at least daily when possible and even arranged to buy a Safaricom Dongle and airtime on our arrival in Voi. Tiju Aziz was kind enough to come down to her shop on a Sunday to make sure we had the dongle for day one. Unfortunately Safaricom neglected to say that the dongle requires a SIM card to actually work and that a SIM card was not included with the dongle. We only discovered this in the evening at Ndololo Public Campsite in Tsavo East, so we had to wait until we came back out before we could get a SIM card. By way of an apology, the clip below was taken today. We left our homes just after 3am and headed for Aberdeen Airport for the KLM flight to Amsterdam. We had 12 hours to waste in Schipol Airport before our Kenya Airways flight to Nairobi, so we ate pizza, wandered around, ate pasta, wandered around and then finally found a special area for people with long stop-overs. This was a treat to be sure! Comfy seats, free wireless broadband and television. We tried to sleep but couldn't, so we each took turns on a bizarre water-massage thingy. It looked like some kind of cryogenic chamber as it closed around you but the massage it gave was both relaxing and invigorating and we all agreed it was five euros well spent. Eventually the time arrived for our flight to Nairobi, which was somewhat delayed by a strike in Greece and the no-fly zone over Libya. By the time we had cleared Nairobi Customs, it was after 8am. We picked up the Landrover hired from Roving Rovers and headed south towards Voi. Only once we were on the road did we realise we had been given one with a single roof hatch, big enough for two people, despite requesting one with two roof hatches because there are four of us on this trip. We reached Voi around 2pm and picked up supplies, booked our rooms for Tuesday night in the Silent Resort and headed round to Ashtech Systems to meet Tiju and collect the dongle. Unfortunately we couldn't phone her, as our phones had been blocked from overseas usage – despite having had “global roaming” set up on the account for six years – Big thumbs down for Orange! With all the hassle of the long journey and things not going according to plan, we were looking forward to getting into Tsavo East National Park and starting our safari proper. After a brief run around the Voi River Circuit, we headed for the Ndololo Public Campsite, to be greeted by a family of elephants. Dave commented that this was a very appropriate way to start the safari, as our blog is intended to raise money for Save The Elephants. In our short run round before pitching camp we saw several bird species, including Superb Starling and Yellow-Necked Spurfowl and a few we will have to identify from books when we return; we also saw Grant's Gazelle, Burchell's Zebra and plenty of elephant. Not a bad start to the safari! Howard provided the entertainment for the evening by making such a hash of starting the fire that the camp watchman came over and started it for us, much to the amusement of Karen, Jason and Dave. We started Day Two with more elephants, then some Coke's Hartebeest and Waterbuck on a trip round the Kanderi Swamp. The swamp, which used to be a watery haven for many creatures has been parched almost dry by the dreadful drought that has hit East Africa over the last three years. We still managed to see many different birds, including Red-Billed Hornbills, a Secretary Bird, a Glossy Starling and one below, which we have not identified (perhaps some of our Kenyan bird-watching friends can tell us before we look it up at home?). Must look this up when we get home! Whilst we were hanging around Kanderi Swamp, one of the local tour groups arrived but quickly left, they then reversed back at speed and the guide told us he had a report of lions on the radio so we could follow him to them. Big thumbs up to you Sir, whoever you are! Asante sana! We ended the day photographing the comical antics of the resident Yellow Baboon troop in the campsite. This time it was Dave who gave a fireside comedy turn, as he dropped four sausages into the fire, one after the other, from the sharpened stick he was holding over the fire to cook them. He eventually gave up and used a frying pan. Today we headed to Mudanda Rock, where we had previously seen lots of activity at the huge waterhole the rock creates at its base. However the waterhole was completely dry! 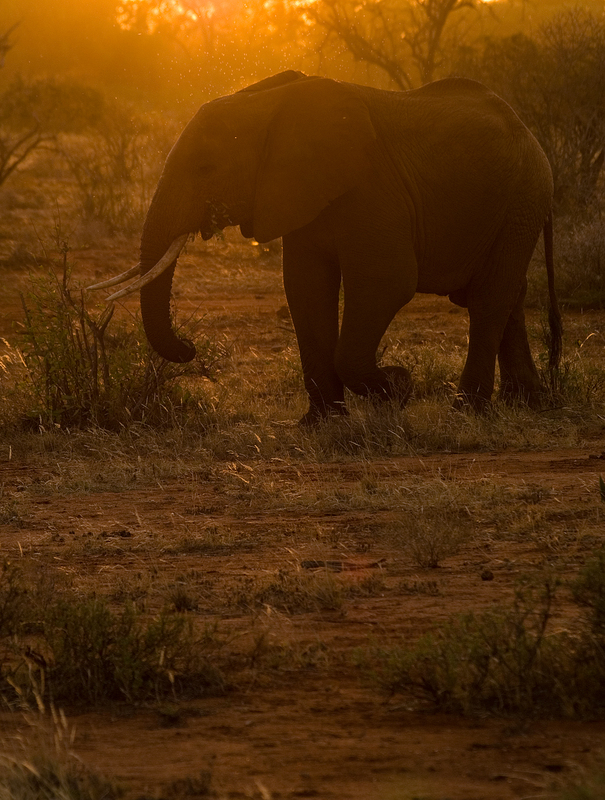 On the way we photographed elephants, beautifully lit by early morning light. We also stopped to photograph the carcass of a recently deceased Giraffe. Jason provided the entertainment this time, by shooting several identical images of the Giraffe with his camera on motor-drive, to which Dave responded “it's nae moving that fast!”. We also photographed zebra, Somali Ostrich and a family of Black-Faced Sand Grouse. 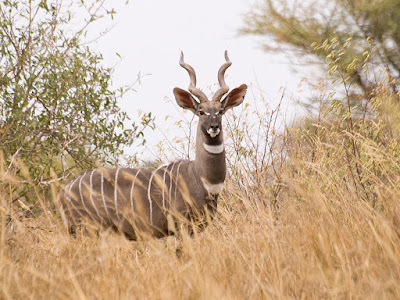 From Mudanda Rock, we headed for Luggard's Falls, where we were delighted to find one of our favourite antelope, the Lesser Kudu. We spent the late afternoon along the Pipeline Road, where we found many Elephants, Storks, Tawny Eagles and a huge flock of Red-Billed Quelea. As Karen, Jason and Howard regailed Dave with tales of the Taita Falcon they had witnessed hunting Quelea at Kanderi Swamp on a previous safari, two Taita Falcons appeared! They first chased off the Tawny Eagles, then dove repeatedly into the flock of Quelea, occasionally catching one. We ended the afternoon on a bit of a low, though, as we spotted a badly injured Elephant bull, with what appeared to be a broken leg. 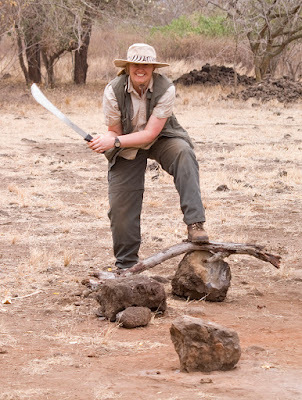 We returned to the Voi Gate and informed the KWS Rangers, then headed into Voi to pick up supplies and check into an hotel for a rest and a much-needed shower. We hope you have enjoyed this post and will consider donating to our chosen charity Save The Elephants through our Just Giving link. The flight from Aberdeen to Amsterdam Schipol was on time, though we were not impressed with the in-flight snack, which consisted of two slices of over-processed cheese between two slices of dry bread and a tiny glass of fruit juice. Approaching Schipol, we passed over several large offshore wind-farms. It was no surprise to see more wind-power turbines on the land too; after all, this is the land of the windmill! The airport at Schipol is huge, with a multitude of shops and restaurants to keep you busy but 12 hours in this place is too much for anyone...especially as it has taken us almost 8 hours to find free wifi!!! 12 hours in an airport makes Karen take silly photos! 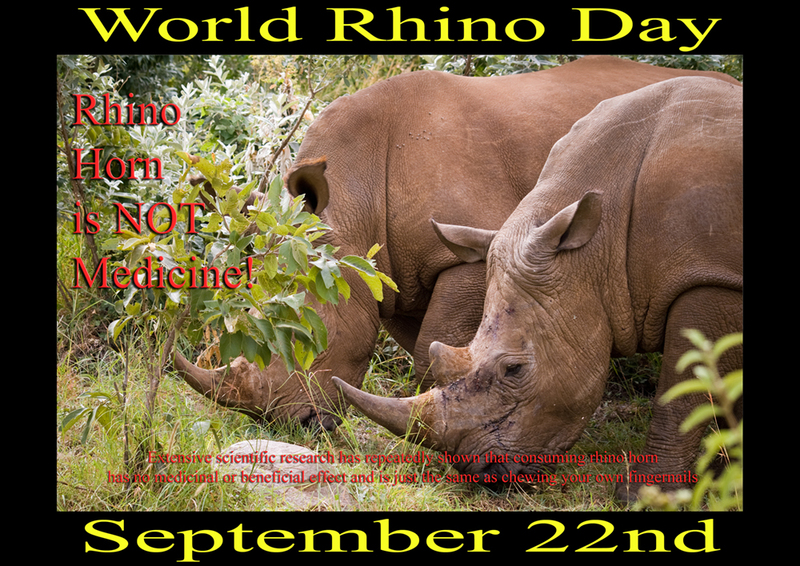 Today is World Rhino Day! This event was established to raise the profile of rhino conservation and to encourage awareness of the issues facing rhinos today. All round the World, people who care about the desperate plight of rhinos have been doing their bit to make more people and Governments aware of the grave situation facing rhinos today. We made our posters available for anyone to download at http://www.photoclassic.co.uk/temp/worldrhinoday/. 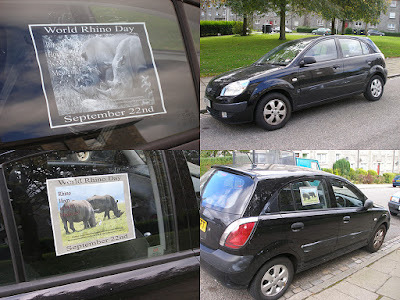 We also printed some of them out and put them on our car. World Rhino Day posters on our car in Aberdeen ~ Scotland supports rhinos!!! So why should people care about the rhino? What is so desperate about their situation and does it really matter? There are several species of rhino in the World today. Most experts list five surviving species of rhino; the White Rhino and Black Rhino in Africa; the Indian Greater One-Horned Rhino, the Javan Rhino and the Sumatran Rhino. However, recent genetic research has indicated that the Northern White Rhino and Southern White Rhino may be seperate species. There are only three Northern White Rhino known to exist in the World today, although there may be a small number still hanging on in Southern Sudan. 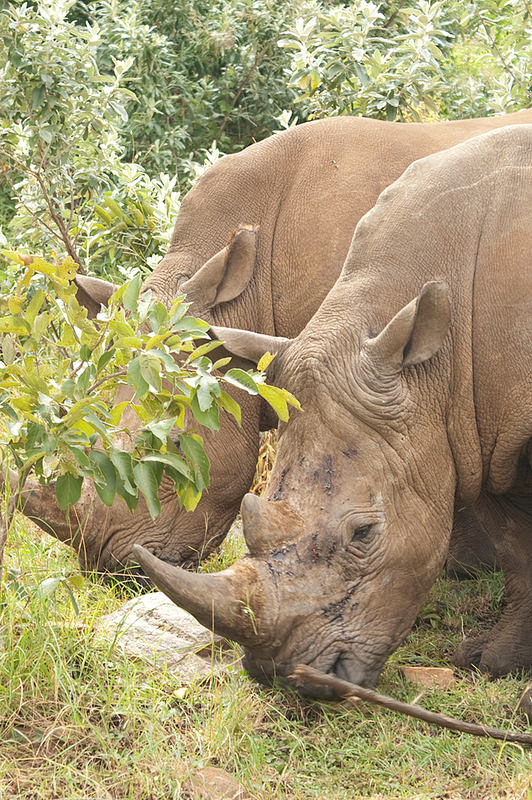 Whilst habitat loss has affected the rhino substantially, the greatest threat has been the increase in demand for rhino horn in countries where traditional Chinese medicine is practised. The economic rise of China, has created a massive wealth boost for middle class Chinese, leading to huge demand for products previously only available to a wealthy few. This has led to a surge in poaching of rhino for their horn. 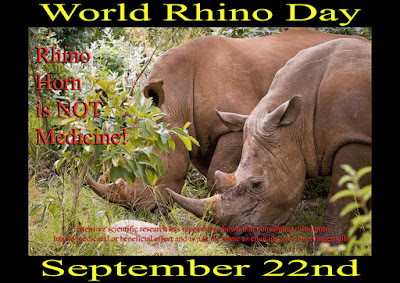 Although extensive scientific research has produced no evidence for any beneficial effect from the consumption of rhino horn, this has not stopped traditional Chinese medicine practicioners from advertising it as some kind of panacaea for everything from irritable bowel syndrome, to high blood pressure and even several forms of cancer!!! Goodness some people are really gullible and deserve to be swindled of their money but that doesn't mean the rhino deserves to die in the process!!! 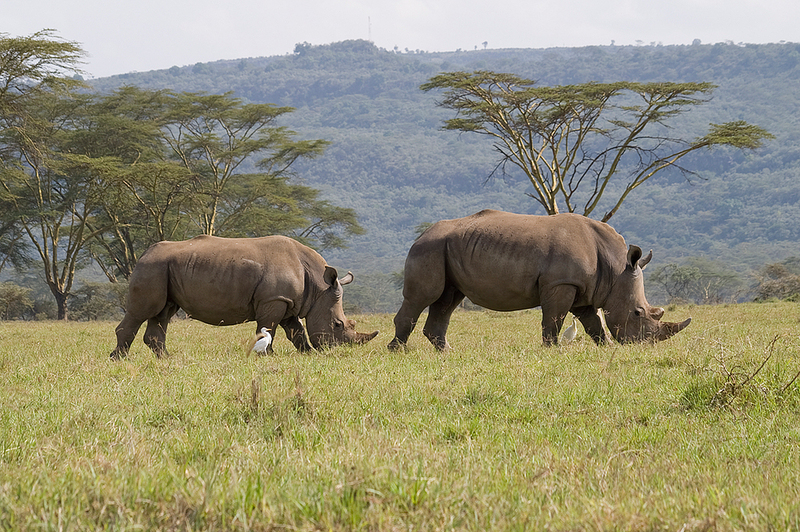 Rhinos are important species in their environments. They have very large ranges and as a result, are vital pollenators through seed distribution in their dung. They also have a role as environmental engineers, creating change in habitat structure that benefits other species. Whilst several countries have made great efforts to conserve and protect their rhino populations, they are struggling against the increasing commercial demand for rhino horn, which has led to levels of poaching that have not been seen since the 1970s and 1980s. 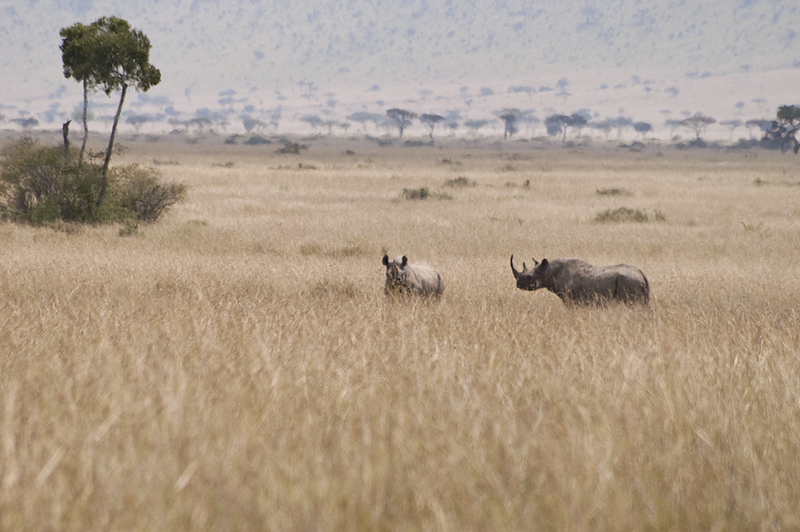 In 1970 there were 65,000 Black Rhino in Africa, with over 20,000 of those in Kenya. By 1987, poaching had reduced the population in Kenya to just 387!!!!! In 1995 the total African population of Black Rhino was just 2410, a reduction of 96 percent in only 25 years!!!!!!!! In 1984 the Kenya Wildlife Service started conservation projects in Tsavo and Nakuru initially to try to arrest this catastrophic decline and some success was achieved with a moderate increase in population by 2005 to 539. 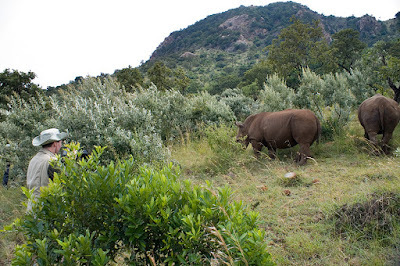 Similar efforts were launched to preserve the White Rhino population in Southern Africa, resulting in one of the great success stories in conservation, as the population of Southern White Rhino increased to such an extent that in 2006 CITES downgraded the animal's listing to Appendix II in South Africa and Swaziland. The IUCN also took them off the threatened list. However, the optimism this encouraged was to be short-lived, as the growth of China as an economic power has led to a massive increase in demand for traditional Chinese medicine in recent years, leading to a huge increase in not only the level but the sophistication of poaching operations. The Chinese Government has recently imported a large number of White Rhinos from South Africa, with the intention of farming them for horn, to supply the traditional Chinese medicine market. Some Southern African countries have suggested that farming rhino for their horn may help reduce poaching. However, we feel this is a mistake, as it costs thousands of dollars to keep one rhino, which will produce around one kilo of horn per year. 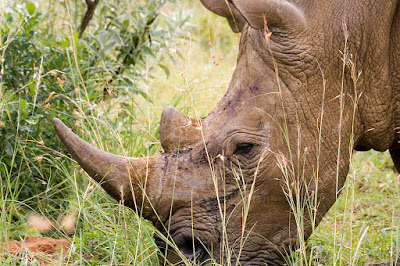 However, for the 25 cent price of a bullet, a poacher can take a 3-5 kilo full horn from a dead rhino, so there is no way that a legitimate market for farmed rhino horn can meet the demand and reduce the level of poaching, when the rewards are so high. Meeting White Rhino for the first time, we were struck by how docile and tolerant these immense creatures are. As you can see from the photo above, they were quite comfortable with us approaching very close; in fact, on one occasion in Lake Nakuru National Park, Howard accidentally leaned on the car horn whilst attempting to shoot round Karen, with a pair of White Rhinos no more than ten feet away and they did not even twitch! On this, World Rhino Day, our greatest hope is that enough people will become aware of the precarious survival of the different rhino species to ensure that Governments will do their part in working to educate the rhino horn consuming nations and work towards preserving these unique, intelligent and magnificent beings. 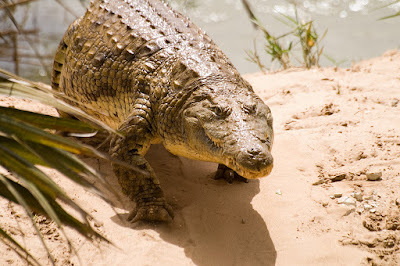 Less than a week to go now and today we will look at memories from a previous visit to Tsavo West National Park. We have only made one brief two-day visit to Tsavo West before, so we are looking forward to spending much more time there and exploring further. 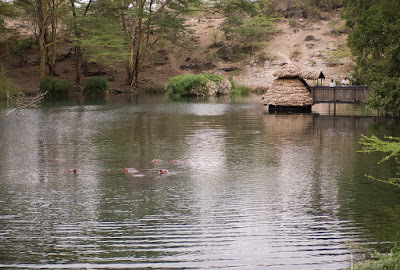 One highlight from the last trip was the magical Mzima Springs, a crystal clear volcanic spring, which creates a beautiful oasis in the middle of semi-arid scrub. The waters of Mzima Springs are home to a fascinating collection of wildlife, from Crocodiles and Hippo to shoals of Barbel. Around the fringes of the Springs, Pied Kingfishers wait to dive in and catch the smaller fish. There is even an underwater viewing area, where you can watch the action beneath the water and enjoy the strangely balletic appearance of swimming Hippos! 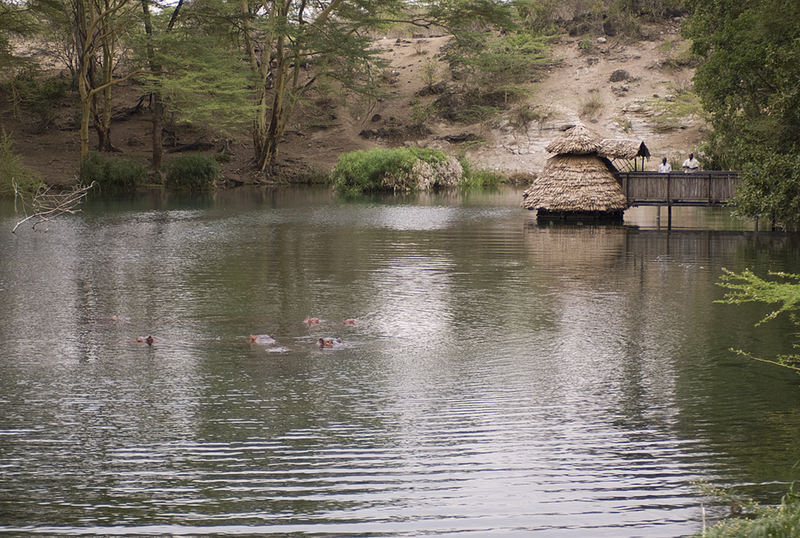 Mzima Springs is definitely on our visit list this time! From the viewing area on the top right, you can see what happens underwater at Mzima Springs. The Pied Kingfisher waits for his dinner to swim by. 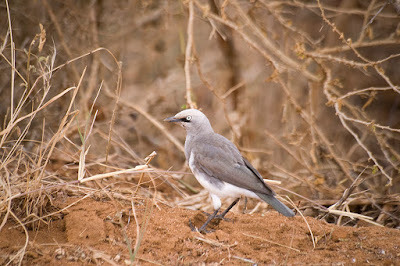 Our first new encounter in Tsavo West was with a pretty little bird we had not seen before, the Fischer's Starling. We also met the beautiful and enigmatic Lesser Kudu, one of the most stunning antelopes. 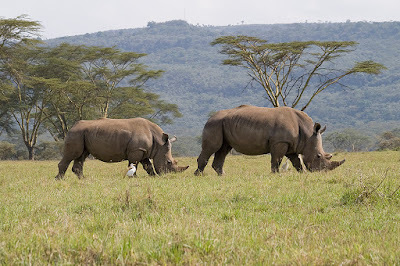 On our only previous visit to Tsavo West, we did not have time to visit the Ngulia Rhino Sanctuary, an enclosed area of the Park, where Black Rhino are bred for re-introduction to areas where they have been previously wiped out by humans. This is another area of Tsavo West that we are really looking forward to visiting. As we will be staying nearby in the Rhino Valley Bandas, there will be no excuse for not visiting this time! We did have something of an adventure in our short stay in Tsavo West last time, as the "airport road" had been washed away in flooding, which gave the little Rav4 we were driving a serious workout on the way to the Public Campsite near Chyulu Gate. 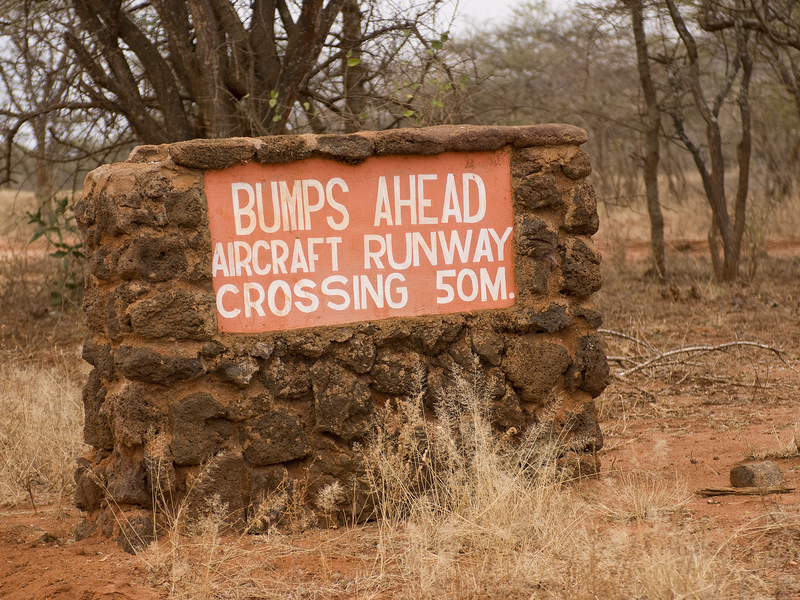 Having spent over an hour bouncing around as we navigated what was left of the track, it was quite amusing when we reached the flatter track at the airstrip, to find a sign warning us about bumps in the road! After bumping and bouncing our way along the Airport Road, we finally reached a smooth track only to find this sign! The campsite itself is in an area full of sharp volcanic pumice, thrown out thousands of years ago by Kilimanjaro, so it is not only rough on tyres but also impossible to pitch a tent on. To get over this, Kenya Wildlife Service has built some custom tent pitches, complete with roof canopies, to put your tent up in. There are also decent areas for building your cooking fires. In such luxury, Jason and Howard felt it only fair that they should relax and let Karen cut the firewood. Cutting firewood is no mean task with a blunt panga! 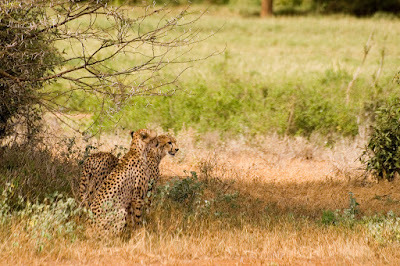 We are all really looking forward to seeing a lot more of Tsavo West National Park on this safari! In the next pre-safari blog we will look at memories from our other wildlife destination for this safari ~ the Masai Mara. With just two weeks remaining till we depart, let's take one more look at some more magic moments from previous visits to Tsavo East National Park. With so many wonderful memories from previous visits here, it is difficult to know what to include and what to miss out, so we decided the easiest way to start would be to look at some of the places in Tsavo East that we have not already mentioned. The Galana River is the only continuous source of water in the whole Park. It forms just outside the boudaries of the Park at the confluence of the Athi and Tsavo Rivers. Being the only permanent water supply, it is a haven for all sorts of wildlife, including some of the largest Nile Crocodiles we have ever seen and pods of Hippos. 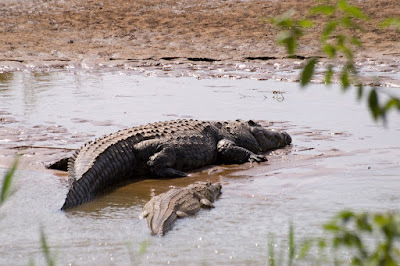 Some of the crocodiles in the Galana are HUGE! When photographing crocodiles, it is very easy to think that they are lumbering, slow creatures but it is not wise to let your guard down, as they can launch themselves out of the river with lightning speed with just one flick of their tails! On land they are much less mobile and they are quite thrilling to photograph. It is amazing to think you are photographing a creature that has outlived almost every other creature on this planet, as they are virtually unchanged since the time of the dinosaurs! On land you can get close but if crocodiles are in the water, they can launch themselves 20 feet up the bank with a flick of the tail, so it is not a good idea to get too close to a crocodile in the water! Along the banks of the Galana we have also seen a multitude of birds, Masai Giraffe, Bushbuck, Waterbuck, Impala, Grant's Gazelle and the delightful little Dik Dik. 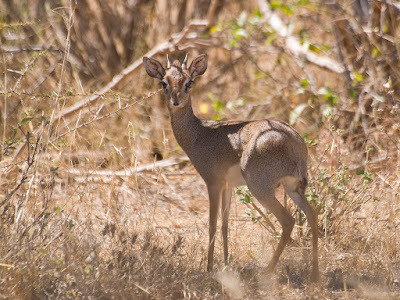 These tiny foot-tall antelope are unique in the antelope world, as they usually mate for life. Having such an attraction to all these animals, means that the Galana River is also prime hunting ground for predators and we have been fortunate to meet, not only several Lions in this area but also a pair of Cheetah. Tsavo actually has one of the largest populations of Cheetah outside of places like Etosha in Namibia but the often dense scrub can make them very hard to find. 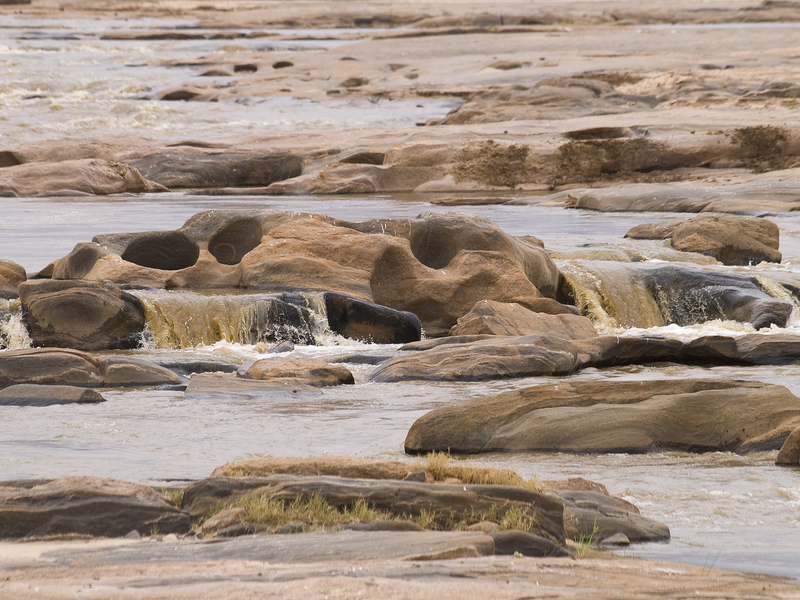 Shortly after the Galana River enters the Park, it reaches Luggard's Falls. During a long day in the vehicle, searching for wildlife around the Park, it is refreshing to be able to take a break and get out at Luggard's Falls to explore the fascinating patterns which have been carved into the sandstone over millenia. 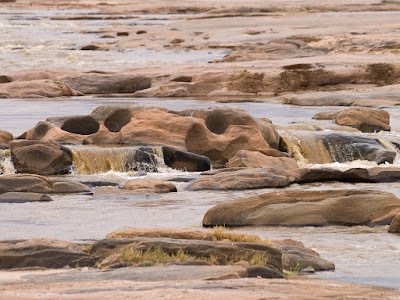 Mudanda Rock is a massive sandstone rock near the western border of Tsavo East National Park. Looking like a miniature version of Uluru, it forms a massive dam, creating an almost permanent waterhole at its base. The first time we visited Mudanda Rock, we did so on the recommendation of some South African friends we had met at the Ndololo Public Campsite. They suggested it would be wise to take our pangas (machetes) with us if we climbed the rock, as it is a prime Leopard or Lion lookout. We arrived at the bottom of the rock, grabbed our cameras and did not forget to take our pangas. The view from the top was breathtaking, as the Park spread out before us, as far as the eye could see. We had not been there long, when we heard a noise behind us. Spinning round and fearing the worst, we discovered that the distant growl belonged to a minibus. Within moments, a dozen women in flowery dresses and high heels were hiking up the rock towards us. Sheepishly we dropped the pangas! They turned out to be a group of school teachers from Nairobi on a staff day out and they a had a good few laughs as we explained how we had been duped by our South African friends. We shared our binoculars and long lenses with them so that they could get a better view of the animals below, then just for a change, we became the photographic subjects, as they proceeded to take photographs of the crazy Scottish people they found on top of Mudanda Rock! The Pipeline Road is actually a contractors' road to allow servicing of the water pipeline that runs all the way from Mzima Springs in Tsavo West to Mombasa, passing through Tsavo East along the way. The pipeline springs leaks frequently, creating impromptu waterholes along the road, which attract plenty of wildlife, including Burchell's Zebra, Coke's Hartebeest, Eland and Buffalo. There are several primate species in Kenya but the two most common in Tsavo East National Park are the Yellow Baboon and the Vervet Monkey. 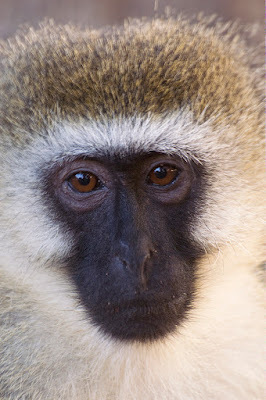 The Vervets are pretty little monkeys, which generally don't bother humans, although they are not adverse to raiding tents or stealing unattended items. The pretty Vervet Monkey is delightful to have around ~ until it steals your dinner and runs off with your underwear! The Yellow Baboon, on the other hand, can be a pest! It only takes one irresponsible tourist to throw food to a Yellow Baboon and a whole troop can become a serious problem for other visitors! 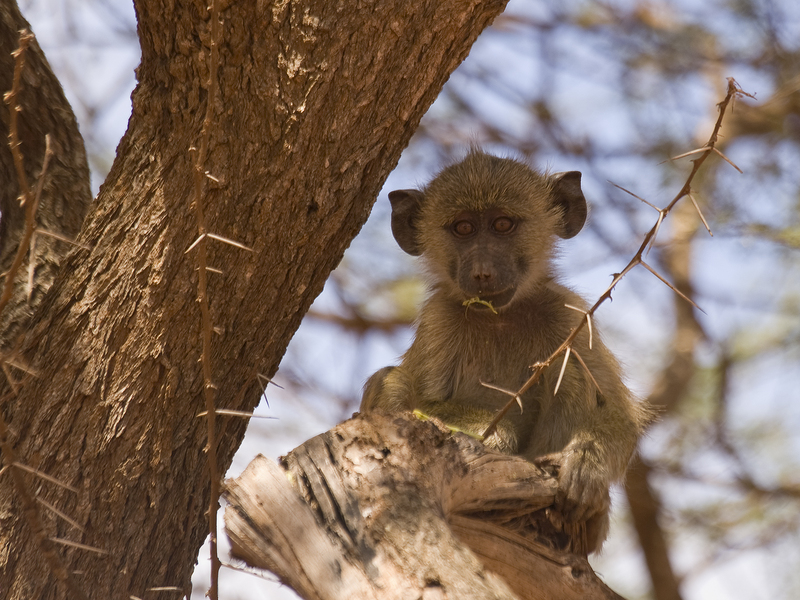 Baboons, like all primates, are intelligent opportunists; they can count and they know when they out-number you! During one safari at Ndololo Public Campsite, Karen had taken the dinner dishes to the stand-pipe to wash them, whilst Jason and I tidied the food away. The Baboons immediately recognised that Karen was alone and began to crowd in closer and closer towards her. 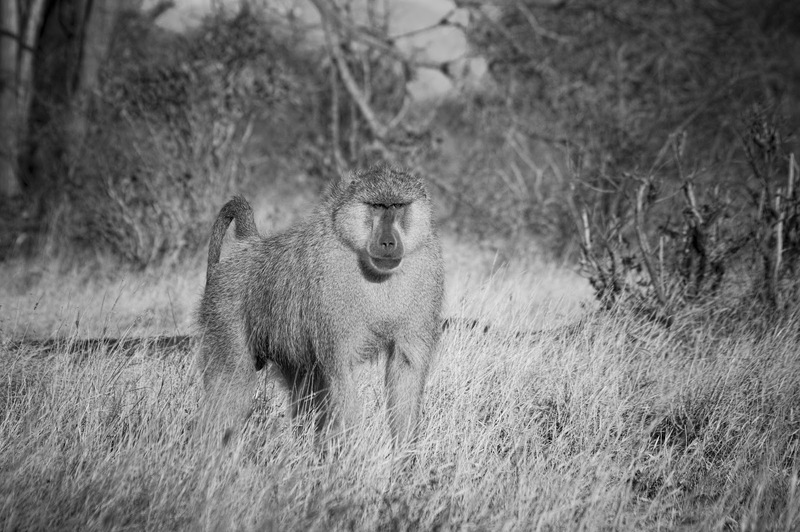 I grabbed my panga and walked towards her slapping the blade on my boot as I went, which quickly dispersed the baboons. However, they immediately recognised that Jason was now on his own and began to crowd around him, shuffling to within 18 inches as he packed up the food. Just when he was starting to worry, he dropped the retaining strap for his Trangia cooker and the Baboons immediately scarpered, screaming in terror. 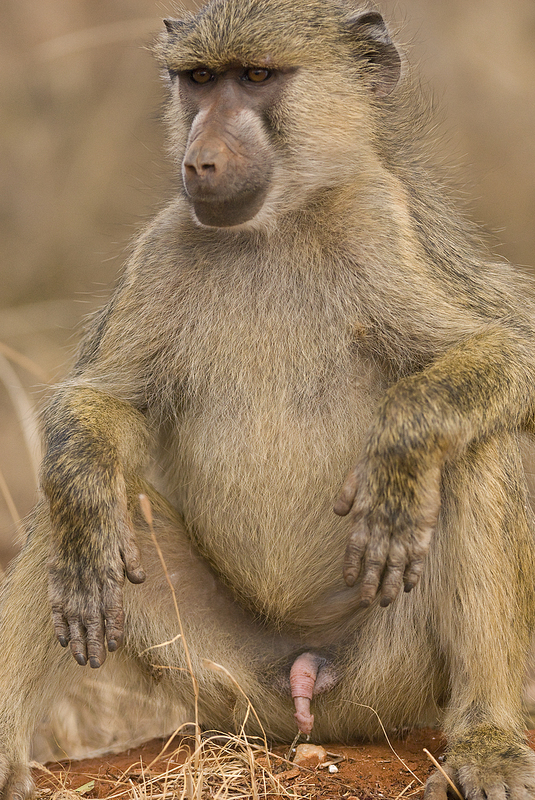 Baboons are absolutely terrified of two things: Leopards and snakes. They obviously must have thought a snake had just emerged from Jason's cooker! Young Yellow Baboons can look very sweet but they can grow into big troublemakers! This is one of our friend jason's photos. 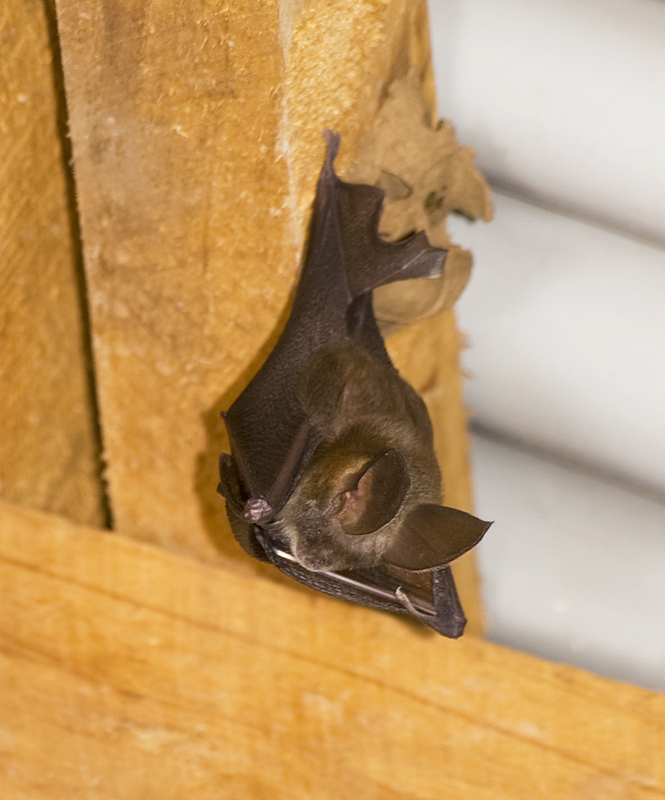 We couldn't conclude a look at previous memories from Tsavo East without mentioning bats. As a zoologist, Karen's particular area of expertise is in bats and we have been fortunate to find and photograph three species of bat in Tsavo East. These fantastic creatures make up one fifth of all the mammal species in the World and they perform functions that no other species does. 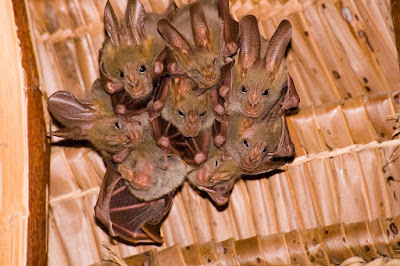 Without bats the problem of disease and illness spread by biting insects would be so much worse, yet these delightful little animals get a terrible press. They are regularly portrayed as evil in both movies and folklore, when in truth they are more helpful to us than we could ever imagine. During one safari in Tsavo East, we entertained a local safari guide's guests in the evening by letting them hear the different calls of bats, using Karen's bat detector. They went away knowing how to differentiate between communication calls, normal echo-location and hunting echo-location. 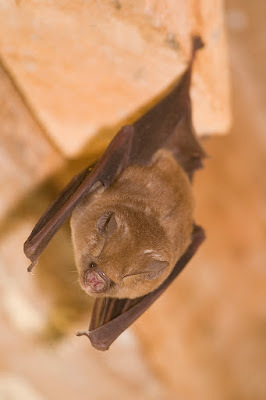 If you want to see bats in Tsavo East, a good place to start looking is in the Makuti roofs of the tourist lodges! We will conclude this post with one final Tsavo East moment, which has been frozen in our memories for all time. In the still of dawn, as the orange light of morning peaked over the horizon, we sat in wonder as a small family of elephants quietly browsed by. The only sound was the chewing of foliage as they passed not twenty feet from us, with the first rays of dawn light silhouetting them and illuminating the flies around their heads. The sights, sounds and smells of that moment will live with us forever! Magic moments like this are what makes life worth living! That takes us back to the start, and the reason we have chosen to do a "live" blog from our safari this year. We hope you have enjoyed this post and will consider making a donation to our chosen charity Save The Elephants through our Just Giving Page. Our next pre-safari blog will look at memories from the second location on this year's itinerary, Tsavo West National Park.